By a cruel twist of fate, Valentina Sviridova and her son were separated in 1943. It was highly unlikely that the mother would be reunited with her son ever again. Against all odd, Valentina kept hoping that her child was alive. Having naturalized as British citizen after World War II, she continued her search. Finally, she received a letter from Russia: her son Gosha was found. These days Valentina cannot wait to clasp him in her arms when Gosha arrives in Britain. The old lady can only talk to her beloved son on the phone and send him numerous letters. Those letters are full of Valentina’s untapped love and tenderness toward her son. The 93-year-old Valentina Rowlands (Sviridiva) starts her every morning by praying for her Russian son. She lives in a nursing home in Britain yet she belongs to Russia heart and soul. She has not seen her son for 63 years. Georgi (Gosha) burst into tears when he received the first letter from his mother. He was completely overwhelmed by the news from the faraway England. Georgi lives in the village of Ust Uda, in Siberia. He works as a gamekeeper. Georgi is a strong man, he has been through many tribulations in his life. But he was crying like a baby on the day he got the letter. In fact, he felt like a little boy who just lost his mother back in 1943. “Momma got busted by the Germans by chance,” says Georgi. “We lived at our aunt’s place in an area occupied by the Germans at the time. My dad joined the army shortly after the war broke out. On that day my mom stepped out of the house to a nearby market. She didn’t carry any ID on her. So she ran into a German army patrol,” adds he. Later Valentina described the circumstances of her arrest in a letter. She had a good command of German at the time. So she tried to explain her reasons to the German soldiers. She told them that she had left her house for a few minutes, to buy some bread for her little son. The Germans seemed to have understood her message. They started smiling. Valentina saw those smiles with some relief – she still hoped that the soldiers would let her go. She had no idea that the Germans were urgently looking for an interpreter, and they decided to use Valentina’s knowledge of German on the spot. The soldiers told her: “You can consider yourself a prisoner of war!” and took her way. The Germans forced Valentina to work for them as an interpreter. They promised she would be able to return to her soon in the end. Soon the Germans retreated, and Gosha was left behind the frontlines. Valentina was transported to Germany. She ended up in a British-occupied zone in May 1945. She requested the British military authorities to send her to the USSR. “I’ve got a son out there,” said she. The young and handsome British officer Thomas Rowlands took pity and talked to her at length, in an attempt to reason her out going back to the Soviet Union. “You’ll be sent to a labor camp when you get back to your country. The Soviets are sending everybody who collaborated with the Germans to Siberia. Don’t you forget that you interpreted for the Germans,” said he. Before long Thomas confessed to the Russian girl that he had fallen in love with her. He took her to Britain. They got married, and she gave birth to a son and daughter, named Pavel and Anna. She insisted that their children be given the Russian names. She kept thinking about her motherland. She could hear her lost son’s voice asking “Mommy, will you come back home soon?” every time she thought about Russia. 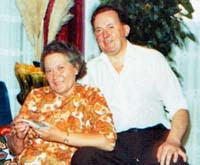 It was not until the mid-1970s that she managed to obtain the whereabouts of a man who met the criteria in terms of age, given and family name. Valentina wrote him a letter. In her heart she could feel she got the right address, somehow she knew that her dear Gosha lived in a small village of the Irkutsk region. She begged him to forgive her for so much time she took to locate him. The mother asked his son to write her back. She wrote that she missed him so much and her desire to see him again was immeasurable. Georgi saw some blotchy marks on the paper of the letter. He reckoned those had been left by the tears his mother shed while writing it. So he believed the contents of the letter. His hands were trembling as he scribbled his reply to Valentina: “Hello, momma. I’m alive and doing fine. But I’m asking you not to write me again – I’m aCommunist, so I may lose my party card, my job and end up in prison if I maintain any contact with a foreigner. Please forget my address if you do care about my happiness.” Georgi felt as if he was in a drowse while sealing that horrible letter. He understood he was repudiating his mother. With a heavy heart he dropped the latter into a mailbox. The mother did as told. There were no more letters from Britain. It is Georgi who wrote her again in 2000. In his second letter, he described his childhood in a war-torn Russia, he described all his life in those years they have not seen each other. And he asked her to forgive him. “I’ve been living with that feeling of guilt to my mom for 30 years,” says the 70-year-old Georgi. “I just couldn’t forgive myself for doing that horrendous thing to her. I’m dismayed to think about the emotions my dear mom was going though while reading that letter – it was my repudiation of her,” adds he. The son was begging his mother to forgive him if she could. “Please forgive, dear momma. I think I’ll understand if you don’t want to have nothing more to do with me. However, I want you to know that your son in Russia still remembers you and loves you,” wrote Georgi at the end of his second letter. He got the reply a week later. “My dear sonny, I forgive you,” read the opening line of the letter. Valentina wrote that she had been living in a nursing home for a year. Her grownup children had families of their own. Her English husband passed away five years ago. “She sent me some photos,” says Georgi and places the pictures on the table. “My momma looks so charming and so kind on these pictures… We’ve been writing letters to each other almost every day for five years now. She often calls me on the phone. I can recognize her voice right away. She speaks very good Russian. She looks forward to seeing me. But she can’t leave Manchester due to poor health. I’d take a trip to England but I have no means to pay for the ticket. Asking somebody for money isn’t my nature. Even the lack of money can’t stop me. I still can’t forgive myself for turning away from my mother,” says he.